Latest edition: February 2019, released 2/14/19 to membership. Visit the Multimedia - File Archive in the Members-Only Portal for copies of the latest and all past editions. 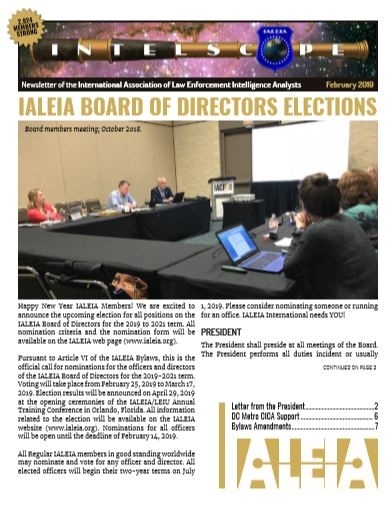 IALEIA publishes the Intelscope multiple times per year, featuring news from the local chapters, information regarding available training and articles of interest to law enforcement analysts. IALEIA’s most valuable asset is its membership and the experience that we have as a whole. This year we are asking our members to take a moment and contribute to your newsletter, the Intelscope which is shared worldwide with your peers. We are seeking articles about training, methodology, certification, standards or the processes we rely on everyday to complete our analytical mission. By contributing to the Intelscope you will share your experience, knowledge, and enthusiasm with your peers while earning the professional development experience that is now required through the published Analytical Standards. Please submit a short article on any of the following topics for consideration in the next Intelscope to communications@ialeia.org. Analytical Toys: Articles that can include tips, tricks and lessons learned using different products, methods or processes. What’s Hot: Analysts are responsible for knowing what the current trends are in their jurisdiction and we should also be aware of what is going on in the rest of the world. Articles in this section could reference the changing directions of policing and crime focus that may change funding sources, resource allocation and opportunities in the future. (Intelligence Led Policing, Terrorism, Gangs, etc.) This section may also highlight breaking news from around the world. This includes: events or information that will change our environment and possibly impact our work focus (illness of a world leader, etc). Aha! Moments: Success stories about analysts, units or investigations where the analysis was instrumental in clearing or prosecuting the case. Limit investigation details to what is a matter of public record. Where are we going? Articles in this section can highlight where our profession is moving. Job opportunity trends, resources, policy, certification and standardization. Other topics of your choice.